But unlike the New York Fed yesterday, ZEW named names and pointed fingers. Yesterday, I speculated about what might have caused the optimism of manufacturing executives in the New York Fed’s district to collapse by the most in the survey’s history. The forward-looking index plunged in the April survey more than it had during the worst month of the Financial Crisis. The survey didn’t say why. So I speculated that it reflected the fear in Corporate America of a trade war between the US and China, not because US companies might see their exports to China get hit with retaliatory tariffs – there are woefully few manufactured exports from the US to China – but because Corporate America’s supply chains have been offshored to China and beyond, and the proposed US tariffs would make the components and materials more expensive for US manufactures, thus squeezing their profit margins extracted from offshoring. 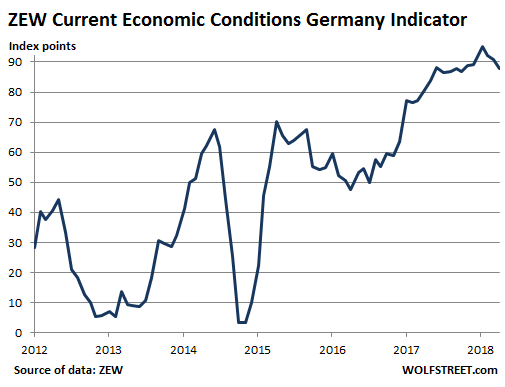 Today, it’s the turn of Germany AG to express its fears about the trade war and slowing conditions in Germany and the Eurozone via the Financial Market Survey by the Center for European Economic Research (ZEW). But unlike the New York Fed yesterday, the ZEW report named names and pointed fingers. 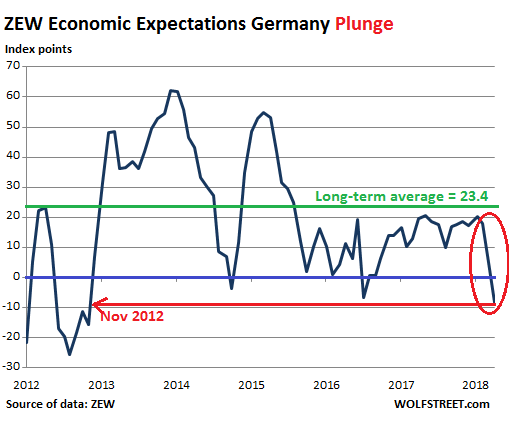 The ZEW’s Indicator of Economic Sentiment for Germany in the future dropped sharply — and very unexpectedly, given how swell things are with negative interest rates and the ECB’s purchases of corporate bonds, and all. It fell by 13.3 points to -8.2, the lowest level since November 2012, when the Eurozone was still trying to dig itself out of its debt crisis. The ZEW surveys about 350 analysts from finance, research, and economic departments at banks, insurance companies, and large industrial enterprises, “as well as traders, fund managers, and investment consultants” (methodology). So what is it with expectations for future economic conditions to deteriorate suddenly and by so much – just as the New York Fed’s survey had indicated yesterday – but with the sentiment about current economic conditions remaining high? “The reasons for this downturn in expectations can mainly be found in the international trade conflict with the United States,” the ZEW report explained. It named other reasons for the decline in expectations about future economic development, including “the current situation in the Syrian war,” and internal issues, such as the “significant decline in production, exports, and retail sales in Germany in the first quarter of 2018.” So things aren’t so hunky-dory at home either at the moment. And it’s broader too. Even as the indicator for current economic conditions for the entire Eurozone edged up 1.5 points to 57.7, and thus remains high, the indicator of economic expectations — a reflection of future developments — for the Eurozone fell by 11.5 points to “merely” 1.9. So, different scenarios in the US and Germany, but similar worries: While they’re still feeling good about current economic conditions, these executives and experts have suddenly started to see some nasty clouds. Something to keep our eyes on. So I guess the current US President should be getting a visit from the current Germany President any time soon to talk about this? Well we all pay the piper. Germany has been hiding behind a weak EURO for years, relying on others for its own defence whilst spending on its own social services, controlling the EU with its financial muscle etc. Somehow I don’t feel very sympathetic if they are concerned. Perhaps I should. Good luck USA. Do you see any leading indication relationship between the 2 indexes if you superimpose them? These forward-looking indices show what the respondents are worried about. This event or the conditions that they’re worried about today might not come to pass. But they see it as something that has a good chance of impacting the economic and financial conditions in the future. That’s how far I’m willing to take this. The plunge in the Empire State Manufacturing Survey’s outlook index yesterday — during good times!! — was historic. There is no parallel. These people are super optimistic normally. I’ve written a few times about that gap between their optimistic outlook and their dreary evaluations of the present economic conditions. So this plunge was really, really special. In terms of the ZEW today, it’s to be expected that the firms in an export powerhouse like Germany would worry that the gravy train of the US trade deficits might end. What’s interesting is that the “trade war” talk is between the US and China. So far Germany has not yet received a full broadside. But for an economy that runs on exports and has a long-standing industrial policy that pushes exports, it’s a scary though that trading partners might suddenly push for an equilibrium of sorts. Is there a timeframe for how many months out that these forward-looking index worries could become reality? Like possibly October? That seems to be our boogeyman month..
Re actual trade issues: Good for business and everyone, overall. 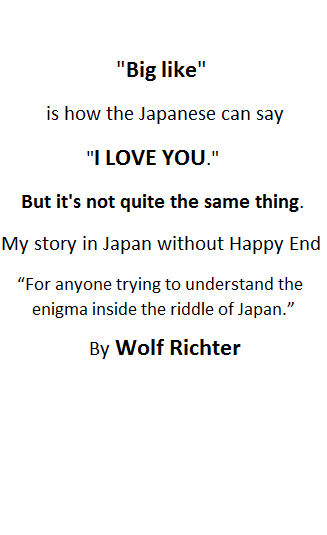 Afterward, it will be a win-win situation. Lots of noise in the middle, suitable to ignore. People who used to screw over the rest of us will scream and try to look like victims. Re the Eurozone: Eventually, that one grain of sand will be the last grain of sand before they meet their consequences. Could be limited to Europe, could be a 10 mile meteor. Suspect the former with limited fallout here. Only a 5 mile meteor. and the dollar looks like a fait accompli? 2013-mid 2015: Yahoo!!! The ECB and Draghi figured out how to print money, manage rates, and make us all prosper … we can live of printed money and make interest rates so low that they don’t matter to people who borrow. Buy sovereign debt using printed money, that’s the ticket. After mid 2015 to current: Well, at least we’re moderate and average and wondering what comes next with our new ECB provided nirvana. Brussels is in control. Buy corporate debt using printed money, too. Lots of it and lots of sovereign debt. Rates are good and low and negative.That’s the ticket. Current: Every time someone mentions rates might rise a semi-smidge, markets fall in a bad way and someone walks it back the next day. Every time. Several times now in a row. Maybe we’re locked into that nirvana and it might not really be the nirvana Brussels claimed. Well, at least we can still screw over the rest of the EU and pillage them with Target2 imbalances. Nobody cares about negative rates as long as they cost less than the taxes needed to pay for what the printed money pays for. Life is good. Just ask Brussels. Plus we have lots of new friends and neighbors from other countries living among us importing their culture for us to admire in wonderment. Life is good. Just ask Brussels. Economic boom time. Invest here. I suggest to place tariffs on all Chinese imports. Then explain that they will remain in effect until the trade imbalance is reined in. i keep having this feeling that something is going to go wrong, but i can’t put my finger on it……. meanwhile, it’s easy to get distracted from the fundamental things that apply. The dirty secret about “made in Germany” labels is that many items are mostly made in China, then only finished in Germany. The unsuspecting buyer thinks they’re getting a quality item. Germany actually has a small trade SURPLUS with China. If you want to get that feeling that “If something cannot continue, it will stop” – just look at the TARGET2 balances. That is what Eurozone central banks owe each other. Unlike the states in the US – these balances aren’t zeroed out yearly. Instead the amount of euros owed by mostly Spain and Italy are set to zoom past 1T (one trillion) euros and not look back. See the scary chart at eurocrisismonitor dot com. And for more fun, Oscar Carboni was showing off a Barrons graphic showing the country by country trade (im) balances between US and everybody. Clearly the big red pipe goes to China at around 500B US a year (negative). But the trade imbalance with Germany is also impressive. See youtube for the ever-energetic Oscar. The EU Trade Commission, besides the now infamous 72% tariff on Chinese cold rolled steel (plus a 12% tariff on the same product originating from Taiwan, suspected to be merely a transshipment point for Mainland steel), has a long list of open investigations into a large variety of imports, ranging from industrial transmission components to flash frozen fish. China tops the list, followed surprisingly close by Turkey. A long distance separates the third runner, Vietnam. China and Turkey share little but have one thing in common: Europe’s supply chains run right through them. Deutschland AG is lately losing some enthusiasm for China as a vendor, and has been shifting their supply chain to countries which guarantee better IP protection and (especially) cheaper labor and bigger financial incentives, meaning Vietnam and especially The Philippines, but hasn’t lost her enthusiasm for China as a customer. I suspect the Herrenknecht factory wouldn’t be such a beehive of activity if China started building more tunneling machines domestically or shifted more orders from Herrenknecht to Hitachi. That’s why the uneasiness: in spite of everything, the EU and the US will eventually converge, either by chance or design, on tougher tariffs on Chinese goods, at least until China makes some concessions (chiefly in the IP sector). China has started retaliating, and she knows where it hurts. The restrictions on soybean imports and hefty tariff on US-grown sorghum are not merely lashing out, but well designed moves to hit very specific sectors of the US economy. No need to tell these decisions have political ramifications which aren’t lost on the Chinese State Council. German exporters have little appetite to be the ones who’ll feel the pinch should the Trade Commission approve more tariffs on Chinese products. They’ve had it so good for so long (courtesy of the euro which eliminated a host of their French and Italian competitors or made them a whole lot less competitive) they don’t even remember what it means to tighten their belts a little. They’ll lobby like they have always done, perhaps they’ll manage to obtain some short-term gains but they cannot stop the inevitable normalization of trade relationships between China and the rest of the world. The question is how any manufacturing in the US can be competitive with this level of labor costs. Everything has been outsourced to the point that key competencies suffer. Companies keep restructuring or merging, unable to focus. In Germany they at least try to keep their labor costs under control, but they still need certain level of sales to keep going.